An example of computing the luminosity function for two u-r color-selected subsamples of SDSS galaxies using Lynden-Bell’s C- method. The galaxies are selected from the SDSS spectroscopic sample, with redshift in the range 0.08 < z < 0.12 and flux limited to r < 17.7. 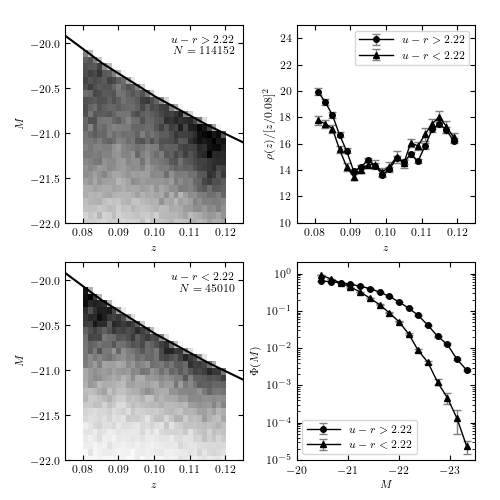 The left panels show the distribution of sources as a function of redshift and absolute magnitude. The distribution p(z, M) = rho(z) Phi(m) is obtained using Lynden-Bell’s method, with errors determined by 20 bootstrap resamples. The results are shown in the right panels. For the redshift distribution, we multiply the result by z^2 for clarity. Note that the most luminous galaxies belong to the photometrically red subsample, as discernible in the bottom-right panel. #  where z is redshift and mu is distance modulus. #  scipy's cubic spline interpolation. """Compute the luminosity function and archive in the given file. If the file exists, then the saved results are returned. print "- using precomputed bootstrapped luminosity function results"